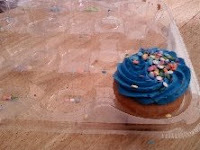 Picture of: the last cupcake from our family's mini party for daughter #2's 16th birthday. Today I:In the last several days I: presented another of the "Grumpy Burgers" telecourses; talked with a library sponsor about booking multiple summer shows; spoke with a client to book February events; wrote more articles; back and forth to the post office and the bank; lots of things going on, making me very busy, causing delays in these posts. Hang in there; happy birthday, Colleen. 11.17.2008 Tuesday: Show Me the Money? 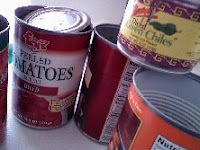 Today I: did the post office run- still not completely paid from one of my big gigs a few weeks ago; worked on new ideations of stories, one about worm farming and another about popcorn; submitted ezine articles; followed up with participants from last night's teleconference; spoken on the phone with a potential corporate storytelling coaching client; twittered a bit; ecoached a few folks; made dinner for my family; worked on post card designs for new marketing. Today I: researched a new set of stories for future storytelling events; investigated a new service for marketing speaker services; created the pdf flyer for the www.executivespeakertraining.com workshop series; twittered at www.twitter.com/storyteller ; made chili for my family; wrote the final script for tonight's artist-marketing telecourse; got a fantastic email from a previous coaching client thanking me for our OISBC training and how it is really starting to pay off for her; presented the telecourse with a great group of attendees; did a milk/bread/teabags grocery run; dropped off some items to family members; calling it a night- fibroarama; I know tonight's course went well, I could hear a couple of people having "aha" moments. 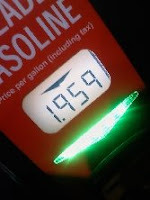 Picture of: price per gallon for gasoline paid this morning at 4:58AM. Picture of: Dustin and I messing around for the camera backstage at last month's Mesa Storytelling Festival. Today I: ran my eldest daughter to work at 5am- ouch; ran amok going to the postal facility servicing my neighborhood; posted the Storyteller.net Amphitheater with audio, transcript, pictures from the 2008 Mesa Storytelling Festival; worked on new blog postings; moved said daughter from work to school to home; cooked dinner for daughters who remain home with me while wife and other daughter camp out in northern Arizona; photo credit to Mark Goldstein. 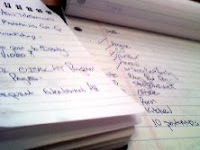 Picture of: pages of notes for new telecourse. Today I: made an early morning errands run and sat in a fast-food joint working on notes; I have released our latest Storyteller.net TeleCourse "Grumpy Burgers, Wood Fires and Cheap Whines: The Economy is Not Your Business for Working Artists" come register; built the websites for those workshops over the last few days; twittered; ran daughter #1 back and forth to work; bought Friday-night snacks with daughters #2 and #3; wife #1 and daughter #4 are away on camping trip; I have more storytelling ideas, projects, writings and seminars that I can get out of my head. 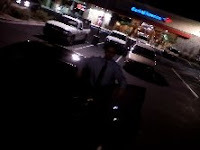 Picture of: mystery storytelling coaching client (he's standing next to his car) I met with tonight for dinner and discussion. 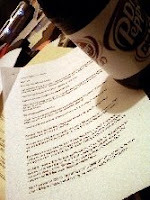 Today I: did the bank and post office run; worked on new publications for storytelling websites; attended conference calls on marketing; worked on developing new performing-arttist TeleCourse; had "let's talk about storytelling" coaching session with a new client in regards to both performance storytelling and corporate storytelling/business storytelling. He asked me a great question about what my advice to new storytellers is- I realized that my advice to newbies has changed a lot in the last 23 years of storytelling and storytelling coaching- I will blog that soon. 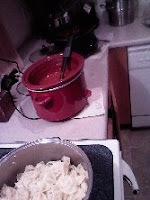 Picture: crock pots full of pasta sauce. Today I: worked on Emails; updated websites; continued on secret projects; prepped and shopped for groceries for family gathering this evening; had a small 18-person family dinner with an a cousin in from out of state as well as a mini-bday party for my Mom who's birthday on the 7th got kinda lost in the wedding events; the last party of the wedding events. So happy birthday again, Mom. Picture of: pictures taken at my brother's wedding yesterday. 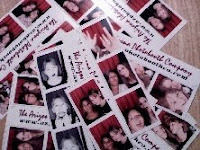 He rented a "photo booth" and it was in constant use for more than three hours. Today I: recovered from the wedding and all the work put into it. 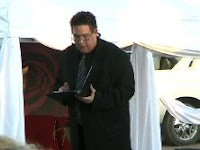 Picture of: me telling stories and doing the official thing at my brother's wedding. Today I: did the errand run thing; worked on this Internet project for a bit; answered Emails about Storyteller.net; picked up daughter #1 from work- NASCAR is in town and her grocery store is one of the main places the racing fans go to get supplies; cleaned up and packed up family and supplies to head out to the wedding site; added what I could to the sound system for the outdoor wedding; was part of the "storytelling at a wedding" wedding with my variant of "the most precious thing" story; the bride was really really stunning; great reception with lots of laughing and really good food; made photo-booth pictures with family- very cool reception idea; drove home with family; looked at the little bit of video we shot; happy wedding day to Michael and Randi; happy birthday to Mom. 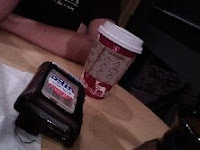 Picture of: my voting sticker on the back of my wallet along with a cup of free *$'s you-voted coffee my eldest daughter is drinking. Today I: did the standard errands of post-officing and banking, sorta the business mirepoix of my everyday, I think; sorted through office stacks; spoke on the phone with a coaching client; set up a couple of appointments for next weeks' storytelling events; worked on the wedding ceremony for my brother #1 and his finance; was tko'd with a fibro headache; walked over and voted; took daughter #1 to *$'s for the free and one paid cup of coffee; watched the Obama in Grant Park- me thinks the president-elect is a practitioner of NLP; this is going to be a huge week with a very intense Internet project I am working on- probably will be few updates this week from me.